Today I'm doing my first Mixed Media Monday!! What a treat doing a project "just for fun!" Mixed Media Monday is a blog that offers a weekly challenge to create an art piece based on a pre-selected theme. This week's theme is "Places." Fatma, the guest host who chose this theme, and the other participants are immensely talented in the area of mixed media art and their works are very inspiring! I am just enjoying being a tag-along! My "Places:" Since I now live in a desert climate, I've been missing my bloom-filled backyard garden in Wisconsin. I took these pictures a few years ago of our overflowing peony bushes and my one-year-old-at-the-time enjoying them. Peonies are in my top five all-time favorite flowers! I stitched and beaded Ava's photo. 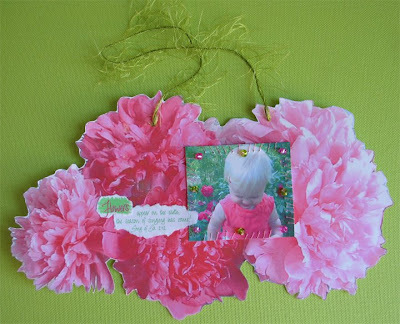 Then glued it and two torn verse pieces to the peony cut-out background. The chartreuse string for hanging was the finishing touch! Voila! Easy & cute for her room! the season of singing has come,"
pretty in pink.. i bet your garden was gorgeous,, nice work! 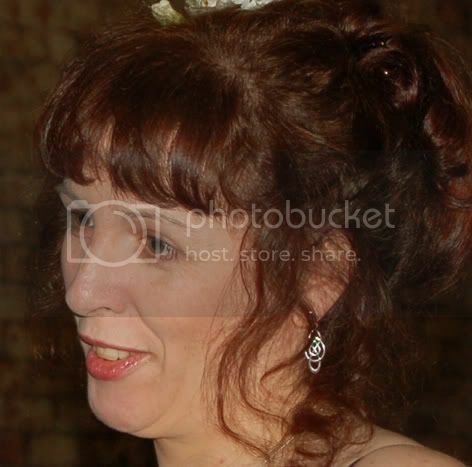 What a gorgeous photo Jeanne! You've obviously enjoyed your first challenge - bravo! Congrats on the Hallmark job... WTG! And I still can't believe those baby birds in the nest on top of your wreath - amazing!! I can just smell those peonies -- what gorgeous artwork! Pretty in Pink. Love your artwork. Pink peonies and your baby girl are a sweet combination. this is lovely!!! so pretty and so perfect in pink...my favorite colour! I absolutely love this yummy colour combination. Vivid and inspiring and positive...thank you!! Such a wonderful creation. Lovely. I found your blog through your message board post. What a pretty photo. I love pink. I'm such a girlie girl..pink and purple LOL. Nice work. This is such a wonderfully vivacious piece and very creative! 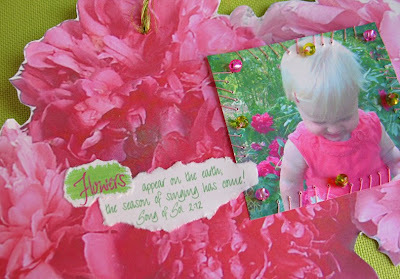 Peonies just burst forth in colour and what a delight to see your little one among them! This is gorgeous. I love pink too. Very unique piece. Oh, this is is just lovely! this is gorgeous, really love it.